The North End is Boston's oldest neighborhood and its colorful history is a huge draw for both visitors and locals. The Freedom Trail leads through the area, stopping at Revolutionary War landmarks like Paul Revere's home and the Old North Church. Of course people also make pilgrimages to the North End for an entirely different reason: huge portions of mouth-watering Italian food. In the 19th century the neighborhood transformed into Boston's Little Italy, and even today it's the best place to find authentic Italian cuisine. How do you even begin to decide where to eat among the dozens of restaurants that line the cobblestone streets of the North End? Here's a guide to help you separate what's genuine from what's not worth your time. Pizza may be Italy's greatest gift to the world, and there are quite a few spots in the North End to indulge in a steaming cheese pie. Ernesto's is a no-frills pizza joint that has been serving up fresh baked pies for over 30 years. They are best known for their buffalo chicken pie - it's not traditional per se, but it's really good. For a more authentic experience try Galleria Umberto, which serves classic Sicilian style slices. They are a lunchtime only joint and they sell out quick, so arrive early! Americanized Italian food is an art form in and of itself. There are tons of great restaurants serving up Italian-American style food in the North End. Some of them have been around for generations, which means they've truly perfected their Chicken Alfredo and Eggplant Parmesan recipes. Try classic favorites like Pomodoro, which specializes in seafood, or Giacomo's, which always has a line around the block to get in (both restaurants are cash only, so hit up an ATM first). Also popular: Al Dente, Mamma Maria, and Panza. If you have a little more money to spend or are looking for a higher caliber restaurant specializing in authentic regional cuisine, make a reservation at Trattoria di Monica, a neighborhood favorite whose expertise is in its pasta dishes (try the squid ink pasta for something a little different). Then there's Quattro, run by local celebrity chef Frank DePasquale. This location is a best of restaurant, combining favorites from his other spots around the city including Mare, Bricco, and El Panino. An authentic Italian bakery is a thing of beauty, and the North End is one of the best places in the country to try one of Italy's most famous sugary export: the cannoli. These ricotta and cream filled pastry shells are insanely delicious and slightly addictive. There are several schools of thought on where to find the best one. The most popular stop by far is Mike's Pastries, an always-crowded bakery that sells cannoli in every flavor imaginable from pistachio to chocolate to blueberry. Give them a try, but save room for a stop at Maria's Pastry. It's not as flashy and definitely more traditional, and is also the winner of Boston Magazine's Best Cannoli award. While you're there order a sfogliatella as well - a cream filled lobster tail that is their specialty. Why stop with just lunch? In the North End you can pick up anything and everything you need to cook your own authentic Italian meal at home. 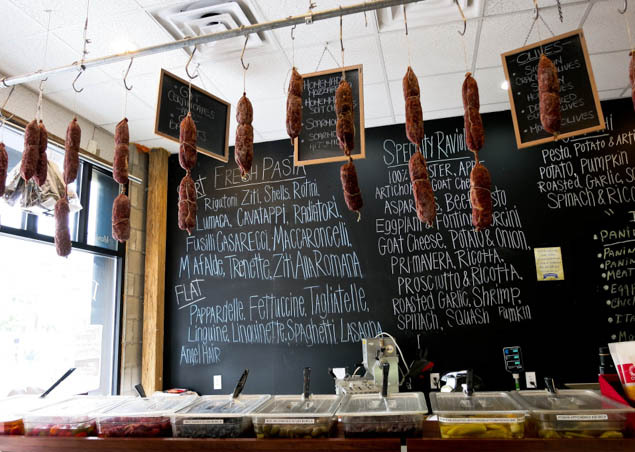 Stop by Bricco Salumeria and Pasta Store for some fresh pasta, or artisan cured meat. Monica's Mercato (the store front of Trattoria di Monica mentioned above) has delicious stuffed ravioli and a good wine selection. If you do your shopping right, you could be enjoying authentic Italian cuisine for weeks to come. What's your favorite Italian dish? What do you think of these trips? Let us know in the comments below! Stephanie Yoder is a girl who can't sit still! Since graduating college in 2007 she has either been traveling or planning to travel. She's lived on four continents and visited everywhere from the Great Wall of China to the Great Barrier Reef. She now writes and travels full time, blogging about her adventures on Why Wait To See The World? (formerly Twenty-Something Travel). Follow Stephanie on Twitter or visit her on Facebook.